As I mentioned yesterday, I decided to scale down the snowball blocks for my Hen Party quilt to 6" finished. When I looked around I found snowball blocks made with different sizes of corner triangles. I like the block best when the corners are 1/4 of the size of the block, so I needed 1.5" corner triangles. Then I sewed right around the block, stitching on the lines, in one pass. After all the blocks were sewn I went back and trimmed all the seam allowances down to 1/4 inch. Some people will recommend that you don't trim the seam allowances here, but just iron up the corners so that there are 3 layers of fabric. I tried it, and it does help to keep the block square. However, I really wanted to be able to iron the seam allowances towards the dark fabric, so I opted to trim off the excess. 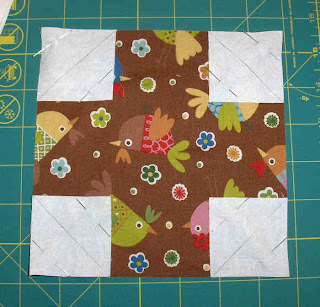 I was glad that I did it, too, because the blocks nested together beautifully when it came time to assemble them. I had my doubts about these when I first got them, but they turned out to be very helpful. The Steady Betty pressing surface is covered with thin foam, which clings to the block. It also drags a bit on the iron, which is a drawback, but not a huge one. So it helps keep the blocks square when you iron them. The mini iron is also great. It gets very hot, so I was able to just let the heat do the work rather than using a lot of muscle. Because it is so easy to handle, I didn't burn my fingers once! And because the iron is very lightweight, I was able to press all those corners while seated, which is another bonus. Tomorrow I'll show you the borders! When I make snowball blocks, or any other block that uses the stitch and flip method, I press before cutting off the extra fabric layers. This helps with keeping the block square. I don't know if this will work with pressing the seams in the directdion you want, though. I couldn't make it work for me, but everyone has their favourite method, don't they? My goal in future is to plan smarter and avoid those small bias triangles wherever possible. 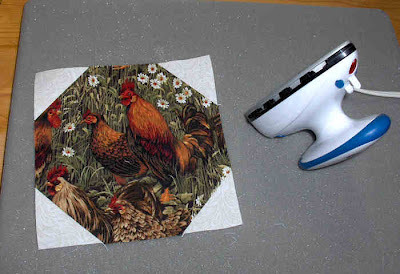 I will probably stick with foundation paper piecing! Good luck, it looks like a fun quilt! what a great and easy way to make a snowball block! Love the chookies prints too. Love the chickens and colours. 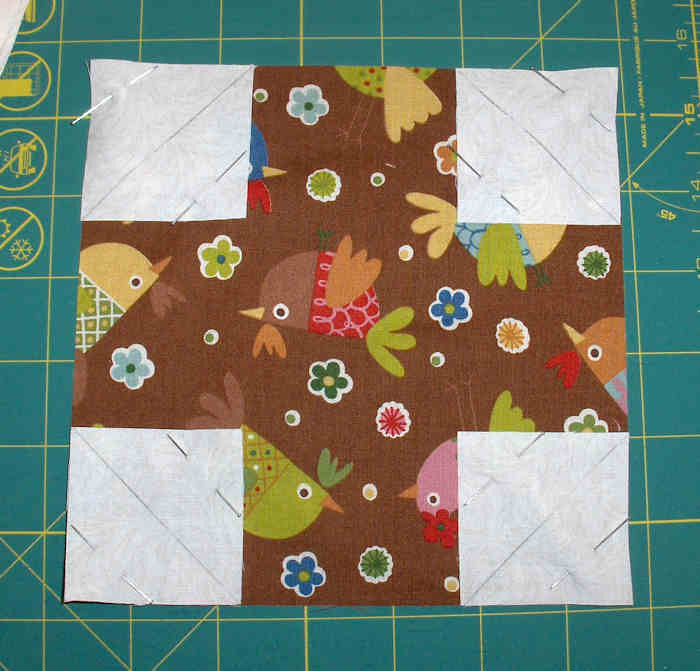 I am very admiring of the accuracy of piecing. It's a skill I haven't mastered! It's going to look terrific. Thank you very much, Katherine and Jillian!